Embrace Home Loans, a direct lending platform that specializes in offering a high level of customer support to borrowers, offers traditional, FHA, and VA home purchase loans and a variety of refinance loans for cash out borrowing or to reduce monthly payments. There’s no cost to submit an application. You'll appreciate that Embrace provides one single, dedicated loan officer to present all of the options to you, gather the necessary information, and guide you through the entire loan approval process. The reassurance of having one point of contact while securing a loan is very valuable to first-time buyers and those who aren’t sure about their best option. Embrace’s fast loan approval process makes it ideal for anyone who needs to arrange home financing fast. Once you’ve set up your loan with Embrace you can make payments through the online portal. After sending these details, an Embrace representative will get in touch to ask for more information and process your loan request. Pre-qualification can take as little as a few hours and the entire loan can be completed within 21 days. Although Embrace has many branches, they are all in only 18 states, concentrated in the South and New England, which is difficult if you prefer face to face contact with your loan officer and live in a different state. Embrace also does not serve borrowers in Montana, Alaska, Hawaii, Vermont, Nevada, and Wyoming. Embrace’s biggest pro is the exceptional service that borrowers receive during their application process. You’ll be assigned a loan officer when you begin your application who will be your single point of contact to guide you all the way until the completion of your loan. You can even choose which loan officer you want to work with by browsing and searching the list. There are no upfront application fees – you’ll only be charged once you decide to go ahead with the loan. Loan approval times are fast and you can choose between conventional, VA, and FHA loans or HARP 2 refinancing loans. On the other hand, there’s no transparent information about loan rates and terms on the website. If you want to know your options you have no choice but to make a phone call or send in an application. There’s also very little explanation about what fees Embrace does charge – you’ll have to ask about those individually as well. While Embrace’s phone and email support is good, it would be useful to have a live chat option especially since there is this lack of information on the website. Embrace’s choice of loans doesn’t include USDA or Jumbo loans so borrowers who need those options have to look elsewhere. Embrace offers traditional fixed rate loans with terms of up to 40 years and variable-rate ARM mortgages. Borrowers with a low down payment of under 20% and who find it hard to qualify for a conventional loan can get an FHA loan through Embrace, which requires a down payment of as little as 3.5%. Active and former military men and women can access VA loans, too. For refinancing, Embrace offers HARP 2 loans at historically low interest rates. It’s not clear what you need to be eligible for a home purchase or refinance loan through Embrace, but your credit score, monthly personal or household budget, and the size of your down payment or the amount of equity in your home all play a part. Embrace doesn’t have any minimum credit score requirement and through the HARP 2 it will offer refinancing packages even to homeowners who owe more than their home is worth. In a drop-down list on the application form and variable-rate ARM mortgages are offered for the standard 5 years, but there’s no clue as to the standard APR rates. For that you’ll have to apply with the quick and easy process and no application fees so serious borrowers won’t face any trouble getting a personalized quote to compare with other options. Embrace’s customer support through a dedicated loan officer is its biggest strength. Being able to turn to a single person who is fully familiar with your situation throughout the loan approval process is a big help. Embrace has branches in only 18 states which means you may have difficulty getting face to face contact, but is easily available for telephone support 6 days a week and via email through the online webform. While it would be helpful if Embrace added live chat to its customer support methods, Embrace also has a lot of helpful educational resources including mortgage calculators and information on choosing the best mortgage type, as well as an extensive FAQ section. 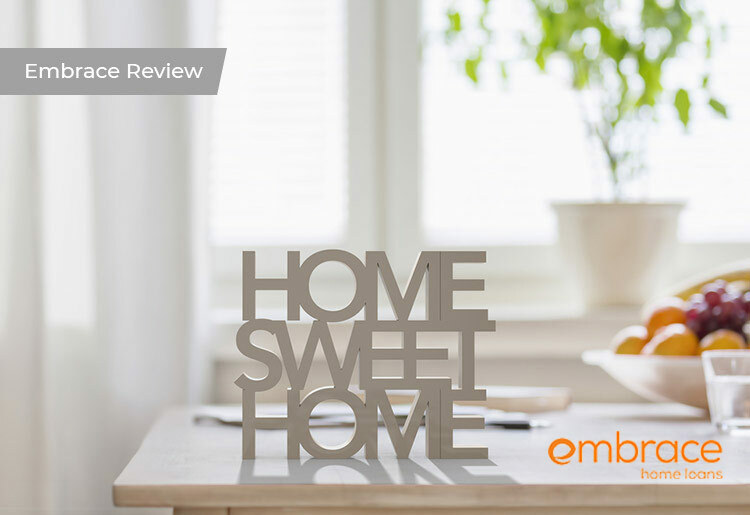 Overall, Embrace is ideal for anyone who wants a personalized home loan service that holds your hand throughout the process. Most borrowers looking to buy or refinance a home will be able to find a loan option that suits their needs, thanks to the range of conventional fixed rate, variable rate, FHA, VA, and HARP 2 loans on offer. Embrace provides a quick and easy borrowing experience with a single dedicated loan officer for better service.